In the past few months, I’ve really come to love polenta. I haven’t attempted it in its baked or fried forms yet but those recipes are in the works. During my most recent meeting with polenta, I decided to get a little crazy (sarcasm) and add some fresh spinach…and some grated Pecorino-Romano cheese – what?? Remember my Cheese Is Love post?? The result was outstanding! How is that just a simple couple of additions can make such a difference? I paired this treat with the most outstanding pork chop recipe I’ve had in years. You can see my change in green below. Bring 6 cups of water to a boil in a heavy large saucepan. Add 2 teaspoons of salt and black pepper. Gradually whisk in the cornmeal. Reduce the heat to low and cook until the mixture thickens and the cornmeal is tender, stirring often, about 15 minutes. (It only took about 5 minutes to thicken but I cooked it for an additional 5-8 minutes to make sure the cornmeal was cooked through.) Turn off the heat. Add the butter, spinach, and cheese, and stir until melted. 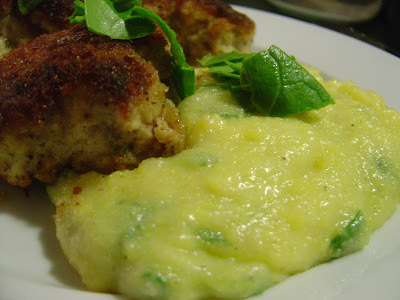 For a quick side, I love the tube polenta too. It’s a completely different texture, but same great flavor. This looks wonderful. I’ll have to try it soon. 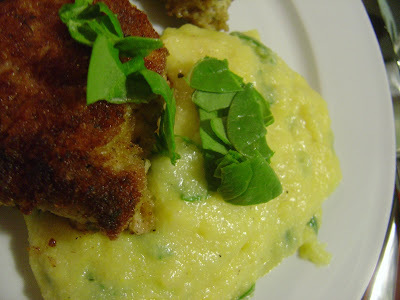 Yum, I love polenta and yours looks great! Oh yummy! I just got some polenta to try for the first time while I’m on this vegetarian kick! 🙂 I’ll have to try the spinach version.